As the price of data analytics software continues to decline and the ease of use increases, it’s a good time for credit unions to begin developing strategies that monetize their member data. While the adoption by smaller institutions still lags behind their larger competitors; it is clearly beginning to pick up. For those credit unions looking to pilot a data project, marketing is the logical place to start. Marketing provides a data-rich environment, it’s exciting and the results can be significant. In fact, the incremental revenues from your data-marketing pilot can fund the expansion of your project beyond just the marketing function. Research recently conducted by the Filene Research Institute (see below) shows there is a lot of frustration on the part of credit union CEOs trying to build a data-marketing functionality. The research first asked CEOs to list their marketing priorities. The 5 marketing goals listed below are in priority order. Next, the CEOs were asked how well their organization was doing in achieving these goals; that percentage is in the SATISFACTION column. The GAP column is the difference between priority and satisfaction and it shows a large percentage of unhappy CEOs. For example; marketing goal #1, identifying members who are good cross-sell prospects is a top priority of 97% of CEOs and only 31% of them feel the organization is achieving the goal. From the research it looks like two out of three (66%) CEOs are unhappy with their organization’s data marketing efforts. Why are almost two thirds of credit unions not able to meet the challenge of using member data to drive marketing? Using member data is a new skill set for many financial institutions. It involves not only the mechanics of collecting data, data discovery and then creating marketing campaigns; but also the unintended organizational changes that occur. You can’t solve a new challenge using old paradigms. Credit union leadership has been successful for decades using a tried and true formula; the formula is changing. There are typically two ways to adapt to this new business model; build or buy. We believe the answer is unique to each organization…but that for most; it is somewhere in the middle. The days of getting to know your members across the desk are fading. Whether they know it or not, community focused institutions are in the process of “redefining” their community. Members in increasing numbers are using remote servicing; adopting online account opening, remote deposit, and online/mobile apps. All this makes it harder to really get to know your members. Data-driven marketing provides a platform for credit unions to replace face to face data gathering with automated data gathering and analytics that match member account behaviors with demographics and other lifestyle characteristics. The basics of nuanced sales and product suitability that credit unions excel at, in a face to face environment, are exactly the same for data-driven marketing. When looking for a vendor to support their project, CEOs need to find a partner that looks to recreate the successful brand dynamics of their face to face selling, in a remote digital environment. Another motivation for CEOs to implement data-driven marketing; there is a good chance your competition is using their data to steal your members. This puts your members at risk (being targeted by competitor’s cross-sell campaigns) of losing them altogether. By running a targeted cross-sell program you can offer your members an appropriate next product, this increases their number of accounts, which increases their revenue and ultimately increases their lifetime value (because with more accounts/member they will be with you for a longer time). Data-marketing also provides the opportunity to expand your marketplace outside the traditional branch footprint. With the proliferation of remote servicing capabilities, many CEOs are considering expanding their market area outside their branch footprint with a remote product/service bundle. Data-driven marketing can be the engine to grow this new remote business. Generally, the process will target new “high likelihood” prospects outside your current branch footprint. These prospects match the characteristics of some of your “best” members and with predictive analytics identify the most suitable product to offer them. This new business strategy can usually be tested by configuring your existing capabilities into a “new” branded service offering. Many consumers are getting comfortable with using remote banking institutions like Ally Bank or Capital One. The last reason to get started using member data is really one of the strongest. Member data is an asset of your organization and it has significant value if implemented correctly. Not using it, is like not bending down to pick up the $100 bill lying on the sidewalk. Simply stated, it is the strategy of using member data to develop insights into your member’s behaviors. These insights improve your member’s experience through improved service delivery, product pricing/structure and more targeted CRM and new member acquisition marketing campaigns. Being able to target the right members, with the right product. By targeting the right members you can achieve the same (or better) results with much less media expense. Cost per account goes down and revenue per member goes up. Creating more targeted creative/positioning. Because you are targeting specific member segments you can create more relevant messaging. These segmented groups are smaller and more homogeneous. This creates improved campaign results by producing more powerful copy and call to action. Structured correctly data-driven marketing not only generates an increase in the amount of new accounts and revenue/member, it creates opportunities to learn more about your member’s marketing, product and service delivery preferences. This learning is put into the member database after each campaign and it is used to design and implement the next campaign. This is called the “process of continuous improvement” When structured correctly, each new campaign makes you smarter. In the New Marketing Analytics the authors articulate a process “Roadmap” for the development of a data analytics strategy (see diagram). The Roadmap can be used as the starting point for designing an implementation plan for your data-marketing pilot. Understanding this process is critical for credit union leadership as they begin making decisions on the budget and personnel resources required, as well as, the potential payoffs of the program. 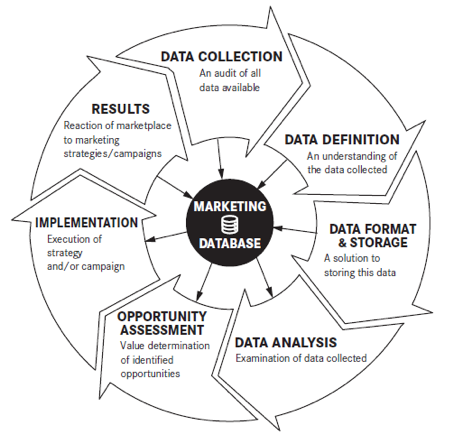 The process template is a closed loop that functions by taking member data from the database to design and implement marketing campaigns. At the end of each campaign all the activity generated (data) is put into the database. This helps improve our understanding of member behaviors; and makes us smarter with each campaign. Each step of the Roadmap is a functional part of your data-marketing platform. How you address each is dependent on your build/buy business philosophy, strategic plan, budget and available personnel resources. This can also be a useful checklist when talking to and evaluating potential vendors to support your project. Within the Roadmap there are eight “core” elements of your strategy that are critical for success. We break them down into two categories: “organizational” and “mechanical” success factors. Organizational factors are those that deal with challenges from your organization/culture and mechanical are those factors involving process and technology. Designating a project lead. Projects are successful when they have an advocate within the leadership team. A team leader who understands the technology, process, marketing and company politics of your new program is a definitely a critical success factor. A culture that supports data-driven decision making. There are many organizations where the conventional wisdom comes from the antidotal experiences of individuals on the leadership team. Introducing data that identifies “best” member segments, member preferences for marketing and service delivery will begin to challenge a lot of this previous “wisdom.” This can cause tension within the team. A culture that embraces these new insights will help smooth out this potential conflict. Dedicate adequate resources. Many smaller credit unions do not have a full time marketing department. They traditionally have responsibilities that are more tactical like collateral materials, managing events and branch signage. A project of this scope requires additional dedicated resources. Staffing this project with associates who already have a “day job” will not work. Establishing realistic goals. Many credit unions that have successfully implemented data-driven marketing have done so over a period of time. Typically the project starts with an outsourced pilot program. The pilot is low cost/low risk and validates the concept for management; providing the confidence to proceed. Growing your data analytics functionality over time so that your organization can catch-up and internalize the changes at each milestone helps create a long-term, custom built solution for your institution. Data Management. This success factor includes the collection, warehousing and analysis of your member data. For this to be successful, the IT and Marketing departments need to work well together. IT has the expertise to implement the technology; Marketing has responsibility for the output and to define the end user requirements. Data Discovery. This involves the analytics process to derive insights from your member data. These insights will drive new marketing, sales and service programs. The process needs to be consistent with your business plan and marketing objectives; although sometimes it is fruitful just go fishing and see what happens. The primary deliverable of this process is the identification and evaluation of potential marketing opportunities. Campaign Development/implementation. This process translates member insights into effective marketing. The marketing opportunities identified in your data discovery are now becoming marketing campaigns. A common mistake in this process is to propose creative that is appealing to you…or the boss. As we begin to use data, the big shift happens, moving your marketing orientation from selling products to selling members (needs based selling).